Cicero is an Imperial assassin and Keeper of the Dark Brotherhood. As Keeper, he is responsible for caring for the Night Mother's body and casket. Little is known of him before 4E 186, when he arrived at the Dark Brotherhood Sanctuary in Cheydinhal and started keeping a journal detailing some of his many contracts. When the Night Mother's crypt in Bravil was desecrated, the coffin was brought to Cheydinhal, and Cicero was appointed Keeper. He was an accomplished assassin who was extremely deadly with a dagger, and while honored to become Keeper, he was reluctant to abandon his work. Before starting his new duties, he was allowed one last assassination, an unnamed jester whose laughter Cicero never forgot. 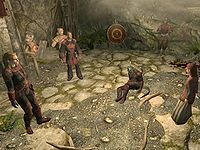 As the Dark Brotherhood slowly deteriorated over the years, Cicero fled to Skyrim with the Night Mother's body, where one last chapter of the organization remained active. He hoped to find a haven for the Night Mother, and to find a Listener who could rejuvenate the Brotherhood. For more information, see the lore article. 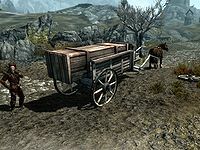 When you first meet him near Loreius Farm, the wagon carrying his "mother" has broken down. Later, his arrival at the Falkreath Sanctuary with the Night Mother's body causes much commotion. Some members of the guild are happy to have the Night Mother and her Keeper present, while others view them as a threat to the new way of running the organization. Cicero's ultimate goal as the Keeper is to locate the anointed Listener, as there has not been one for years. 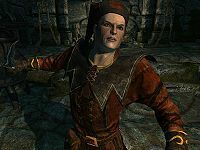 Inspired by his very last assassination for the Dark Brotherhood, Cicero now refers to himself as a jester, and accordingly wears a full set of unique jester's clothing, including boots, gloves, and a hat (the outfit providing slightly stronger enchantments compared to the standard set). In combat, he wields a leveled dagger. Due to his hysterical voice and constant dancing, he is considered eccentric by some and totally insane by many. Upon his arrival at the Dark Brotherhood Sanctuary, he will settle down in the easternmost room and spend the majority of his time there, eating, sleeping, or wandering, at times doing his duties as Keeper and tending to the Night Mother, whose coffin will be put in the neighboring room. In his room, he will scatter all four volumes of his journal, a personal diary he started over twenty years ago. It describes his journey through the Dark Brotherhood and his transformation from a lowly assassin to the Night Mother's Keeper. It also tells the tale about the decline of Dark Brotherhood traditions and his dissatisfaction with Astrid's way of running things. Lastly, it provides an explanation for his mental state. 2.5 ...Go Murder a Clown! "The jester lies dead. My final contract has been completed. Oh, how he laughed and laughed. Until he didn't." Before joining the Dark Brotherhood, pay a little visit to Loreius Farm north of Whiterun. 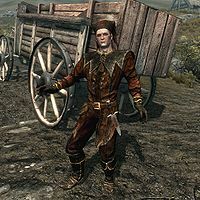 There, you will find Cicero standing next to his wagon, obviously upset that his cargo is stuck due to a broken wagon wheel. When you get close, he will yell "Agh! Bother and befuddle! Stuck here! Stuck! My mother, my poor mother. Unmoving. At rest, but too still!" If you decide to ignore the fact that a jester is standing in the middle of nowhere and ask him if he's got problems, he will explain: "Poor Cicero is stuck. Can't you see? I was transporting my dear, sweet mother. Well, not her. Her corpse! She's quite dead. I'm taking mother to a new home. A new crypt. But... aggh! Wagon wheel! Damnedest wagon wheel! It broke! Don't you see?" When you offer him your help, he will immediately start to dance and give you a suggestion: "Oh. Oh yes! Yes, the kindly stranger can certainly help! Go to the farm - the Loreius Farm. Just over there, off the road. Talk to Loreius. He has tools! He can help me! But he won't! He refuses! Convince Loreius to fix my wheel! Do that, and poor Cicero will reward you. With coin! Gleamy, shiny coin!" Approach him again and he will repeat: "The farmer is at his farm! Where else would he be? Loreius is his name. Talk to him. Convince him to help poor Cicero." Alternatively, you can ignore Cicero and speak with farm owner Vantus Loreius first. When asked about his bad mood, he will be quite upset about the jester down the road: "Is something wrong. 'Is something wrong?' he/she asks. Yes, something is bloody well wrong! Or maybe you missed the demented little man in the jester's garb, down by the road? Goes by the name of Cicero? Crazy fool's asked me to fix his broken wagon wheel five times. He won't take no for an answer. Why can't he just leave us alone?" If you talked to Cicero first, Loreius will ask "That Cicero feller? Hmph. Tell me something I don't know. Crazy fool's already asked me about five times. Seems he's not satisfied with my answer. Why can't he just leave us alone?" If you try to convince him, telling him Cicero will pay him, the angry farmer will respond "Pay me? You think this is about money? Have you seen the man? He's completely out of his head. A jester? Here, in Skyrim? Ain't been a merryman in these parts for a hundred years. And he's transporting some giant box. Says it's a coffin, and he's going to bury his mother. Mother my eye. He could have anything in there. War contraband. Weapons. Skooma. Ain't no way I'm getting involved in any of that." "So long since I worked my blade. So long since I saved a soul. But I am now Keeper. No longer a taker. I think back fondly on my hours with the jester. His laughter, his screams, his pitiful cries. And then, as the end drew near, his laughter once more. Merry in death as well as life. I was honored to know him." At this point you can choose to continue convincing Loreius or decide to help him get rid of the crazy jester. If you choose the former, he will say "What? And just who in Mara's name are you, anyway? Hmm? Come here, telling me my business. And for what? To help a... a... a fool!" If you persuade him to help Cicero, he will stutter "Look, I... I... You're right. You're right. Feller might be nutters, might not. But fact is, he needs help. I turn him away, what kind of man am I, hmm? Look, um... Thanks. And I'm sorry for my unneighborly reaction. If you talk to Cicero, you be sure and tell him I'll be down to help soon." Down at the wagon, Cicero will be more concerned than ever: "Poor mother... Her new home seems so very far..." When you tell him the good news, he will immediately start dancing and thank you: "Oh stranger! You have made Cicero so happy! So jubilant and ecstatic! But more! Even more! My mother thanks you! Here, here. For your troubles! Shiny, clinky gold! A few coins for a kind deed! And thank you! Thank you again." He will bid you farewell with "I will wait for Loreius! Oh yes, mother and I will wait right here, right here until he fixes our wheel." However, if you choose to help Loreius get rid of Cicero, he will come up with a plan: "Well, there is something. There's a guard, patrols the road that crazy jester is on. He passes by pretty often. You could report the fool. You know, say he's done something against the law. That will at least get rid of him for me. What do you say?" If you reject, he will say "Hmph. Fine. Suit yourself. But you're wrong, anyway. Just look at the fool. I don't know what it is, but he's damn well guilty of something." If you accept, he will be happy: "Ha! Wonderful! Like I said, the guard is down by the road. You really can't miss him. You tell him that jester is up to no good, and he'll deal with it. Then come back here, and I'll toss a few coins your way, yeah?" The guard will then turn around and leave Cicero, who will be enraged if you approach him: "Unfair! Unjust! Cicero has done nothing wrong! Loreius will pay for his treachery! Oh, how he will pay... And you! You were no help! Not at all!" At the farm, Loreius will be more than happy and hand you a gold reward: "Ha ha! Oh, I knew I had a good feeling about you! Here, my friend. A few septims, to show my thanks, hmm? And may that twisted little jester rot in a cell for a fortnight!" "Silence! Deafening silence! In my head in my head in my head. It is the silence of death, the silence of the Void. Seeping into me, through the Mother. The silence is hatred. The silence is rage. The silence is love." Later on, a return to Loreius Farmhouse will reveal that Cicero was not just an innocent fool and was even more crazy than Vantus ever anticipated. Approaching the patrolling guard on the road will net you the following warning: "You don't want to go up to that farmhouse, citizen. It's a terrible sight. The farmer and his wife, slaughtered in the night. 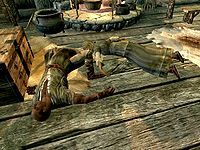 So many knife wounds..." Inside the farmhouse, you will find Vantus Loreius and his wife Curwe slain on the floor, a hint of things to come when Cicero and his coffin show up in the Dark Brotherhood Sanctuary later on. "Oh, yes yes yes! Thank you, thank you, thank you!" Cicero: "But the Night Mother is mother to all! It is her voice we follow! Her will! Would you dare risk disobedience? And surely... punishment?" Arnbjorn: "Keep talking, little man, and we'll see who gets "punished."" Festus: "Oh, be quiet you great lumbering lapdog. The man has had a long journey. You can at least be civil. Mister Cicero, I for one am delighted you and the Night Mother have arrived. Your presence here signals a welcome return to tradition." Cicero: "Oh, what a kind and wise wizard you are. Sure to earn our Lady's favor." Astrid: "You and the Night Mother are of course welcome here, Cicero. And you will be afforded the respect deserving of your position as Keeper. Understood... husband?" Cicero: "Oh, yes yes yes! Thank you, thank you, thank you!" Astrid: "But make no mistake. I am the leader of this Sanctuary. My word is law. Are we clear on that point?" Cicero: "Oh yes, mistress. Perfectly! You're the boss." Cicero will then return to his cargo and the rest of the family will go their separate ways. Astrid will then approach you and start the quest Mourning Never Comes. She will also express her rising concerns about Cicero's motives, but will leave it alone for now. "The Night Mother remains silent. I remain unworthy. I can hear it. Deeper, and deeper. Louder and louder, punctuating the silence like thunder on a calm evening. Laughter." "Loreius has learned the meaning of ugly." (If you helped Cicero) "I am! I am! But not just my mother. Our mother, hmm? The Night Mother! Oh yes! And you helped me! You helped poor Cicero! You talked to Loreius, got him to fix my wheel! Oh, you may have pleased me, but you have surely pleased the Night Mother. And our mother, she will never forget." (If you didn't get involved) "I am! I am! But not just my mother. Our mother, hmm? The Night Mother! Oh yes! But you disappeared! You were there... then you weren't! Did you mean to help poor Cicero or not? I'm left to wonder... Ah, it doesn't matter. What's done is done, right? Cicero is here! As is the Night Mother! Joy of joys!" (If you helped Loreius) "I am! I am! But not just my mother. Our mother, hmm? The Night Mother! Oh yes! Oh, but you didn't help poor Cicero! You helped that stupid farmer! Stupid Loreius! Oh, the guard said cruel things about us. Untrue things..."
"He said I attacked someone! On the road! But it never happened. Never. Sweet mother and I were just waiting. My knife was sheathed!" "He said I was transporting weapons! For the war! In mother's coffin! He made me... open it! Indignity! Sacrilege!" "He said I stole something! Me! Poor Cicero. A common thief. The very thought is insulting. One might even say... maddening." He will then provide a subtle threat about what may happen if you cross him: "Someone lied. Someone told the guard poor Cicero did something he did not. We were detained, delayed! The Night Mother kept from her new home! But you wouldn't know anything about that, would you? Hmmm? No. No... Of course not. Because then Cicero would get angry, and that would be... ugly. Now Loreius. Loreius has learned the meaning of ugly." "Laughing, laughing, laughing, laughing! It is the jester! A voice from the Void, to cheer poor Cicero! I accept your gift, dearest Night Mother. Thank you for my laughter. Thank you for my friend." "Oh, we're going to be fast friends. Fast friends." If you helped back at the farm, or never even met him, you will be able to greet him politely: "So polite! So nice! Cicero likes you. The Night Mother is sure to like you too. Oh, we're going to be fast friends. Fast friends." Alternatively, you can ask him to keep his distance: "Do you mistrust poor Cicero? I am, as you say, just an innocent jester. A fool! Oh, but my work is not foolish, no. For I am our mother's Keeper." Lastly, you can remain silent: "Oooh... So silent. So menacing. A true assassin of the old way. Cicero likes you. Oh yes, Cicero likes you, indeed." Regardless of your choice back at the farm you can then ask him who he is: "Me? Oh, Cicero is just the Keeper! I... keep! I look after our matron, you see. The Night Mother. I keep her clean, and protected, and happy... But I am not the Listener. Oh no. There is no Listener. Not yet! But some day, some day, some day I pray, that one will come to hear her say... The words." He will then elaborate on why he took the long trip from Cyrodiil to Skyrim. "The Night Mother's crypt in Bravil was... desecrated. The Imperial Province is ravaged by strife. Nowhere there is safe, at present. So Cicero brought our Lady to her new home. Here! This is the only Sanctuary left in all of Skyrim, you see. Such was my... honor. As Keeper." On asking about his duties as Keeper, he will explain: "Oh, Cicero takes care of our Lady's body. Oils it, preserves it, keeps it safe. Makes sure nobody disrespects our Matron's coffin." When asked about the Night Mother, he will say: "What? Who is the Night Mother? Oh! Oh, you jest! You jest with gullible Cicero! You of course know that the Night Mother is our Unholy Matron. The undying spirit of a great woman who birthed the children of Sithis. And killed them. In his honor." Finally, he will tell you about Sithis: "Hmm... That's like telling you about the cold of space, or terror of midnight. Sithis is all those things. He is... the Void." 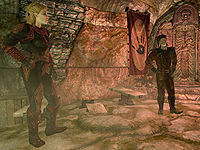 When you have completed the job for Muiri in Markarth, you are told to return to Astrid in the Sanctuary. However, Astrid's paranoia is rising due to a certain jester with some odd behavioral traits: "It's Cicero. Ever since he arrived, his behavior's been... Well, erratic would be an understatement. I do believe he is truly mad. But it's worse than that. He's taken to locking himself in the Night Mother's chamber, and talking. To someone. In hushed, but frantic tones. Who is he speaking with? What are they planning? I fear treachery." Astrid, clearly afraid of Cicero endangering her leadership, says "As the Night Mother's Keeper, he believes he's entitled to the rule of this Sanctuary. Cicero will cite our independence as the need to revert to the Old Ways. He'll claim we're undisciplined, unruly. Heretical, even. Ironically, the Night Mother could prove to be just as much a victim. The queen in a fool's twisted game of chess." She then asks you to go spy on Cicero from inside the Night Mother's coffin. This starts the quest Whispers in the Dark and you will have no choice but to unlock the coffin and close it behind you. "I love the laughter, dearest Night Mother, but still I long to hear your voice. It's not too late! Speak to me, my mother! Speak to me, that I may set things right! I can save the Sanctuary, I can save the Brotherhood! You can have the laughter! Take it back! An exchange, then? The laughter for your voice?" "Our sweet Lady is maiden, mother... and crone..."
From inside the coffin, you will soon hear Cicero enter the room, cheerfully humming as always. "Are we alone? Yes... yes... alone. Sweet solitude. No one will hear us, disturb us. Everything is going according to plan. The others... I've spoken to them. And they're coming around, I know it. The wizard, Festus Krex... perhaps even the Argonian, and the un-child... What about you? Have you... have you spoken to anyone? No.... No, of course not. I do the talking, the stalking, the seeing and saying! And what do you do? Nothing! Not... not that I'm angry! No, never! Cicero understands. Heh. Cicero always understands! And obeys! You will talk when you're ready, won't you? Won't you... ...sweet Night Mother." The Night Mother then speaks into your ear, saying "Poor Cicero. Dear Cicero. Such a humble servant. But he will never hear my voice. For he is not the Listener." Outside the coffin, Cicero will continue: "Oh, but how can I defend you? How can I exert your will? If you will not speak? To anyone!" When he is finished, the Night Mother speaks again: "Oh, but I will speak. I will speak to you. For you are the one. Yes, you. You, who shares my iron tomb, who warms my ancient bones. I give you this task - journey to Volunruud. Speak with Amaund Motierre." Outside, Cicero continues his ramblings: "Poor Cicero has failed you. Poor Cicero is sorry, sweet mother. I've tried, so very hard. But I just can't find the Listener." Finally, the Night Mother tells you the secret words to convince him: "Tell Cicero the time has come. Tell him the words he has been waiting for, all these years: 'Darkness rises when silence dies.'" At this point, Cicero will become suspicious and pry open the coffin, yelling "What? What treachery! Defiler! Debaser and defiler! You have violated the sanctity of the Night Mother's tomb! Explain yourself! Speak, worm!" When you tell him the Night Mother spoke, he will respond with "She... spoke to you? More treachery! More trickery and deceit! You lie! The Night Mother speaks only to the Listener! And there is... no... Listener!" When you tell him the secret words, he will be shocked: "She... she said that? She said those words... to you? 'Darkness rises when silence dies'? But those are the words. The Binding Words. Written in the Keeping Tomes. The signal so I would know. Mother's only way of talking to sweet Cicero..." He then starts to dance maniacally. "Then... it is true! She is back! Our Lady is back! She has chosen a Listener! She has chosen you! Ha ha ha! All hail the Listener!" Suddenly, Astrid breaks through the door, shouting. Astrid: "By Sithis, this ends now! Back away, fool! Whatever you've been planning is over! Are you all right? I heard the commotion. Who was Cicero talking to? Where's the accomplice? Reveal yourself, traitor!" Cicero: "I spoke only to the Night Mother! I spoke to the Night Mother, but she didn't speak to me. Oh no. She spoke only to him/her! To the Listener!" Astrid: "What? The Listener? What are you going on about? What is this lunacy?" Cicero: "It's true, it's true! The Night Mother has spoken! The silence has been broken! The Listener has been chosen!" While Cicero dances, Astrid will approach you and demand an explanation. When you tell her about Amaund Motierre, she will say she needs time to think things over. When she leaves, Cicero will cheer: "You are the Listener! You are the Listener! I have served mother well, I have!" He will now have a new batch of information ready, should you happen to ask, including changing his previous statement if you ask him to explain a bit about himself: "Me? Oh, Cicero is just the Keeper! I... keep! I look after our matron, you see. The Night Mother. I keep her clean, and protected, and happy... But I am not the Listener. Oh no. You are the Listener! You heard the words! And everything will soon be put right." If you ask him if he actually wanted to be Listener himself, he will respond: "Oh... Well... yes. I did. I did indeed. I tried to listen. Tried so hard. But the Night Mother never spoke to poor Cicero. The silence became almost... maddening. Oh, but that was then! This is now! You're the Listener, and the Night Mother chose you for a reason, I'm sure! Cicero will remain the happy Keeper." When you ask him what a Listener does, he will explain that "Oh, the Listener, well... listens! The Night Mother speaks to you. Guides you on your path. But when the Night Mother speaks, the Listener must obey. You must! For her word is the will of Sithis. And Sithis is the Dark Brotherhood incarnate." Lastly, if you ask if she will ever speak again, he will laugh. "Ha! Surely you're pulling Cicero's leg! Wait... the Listener is serious? Oh. Well of course the Night Mother will speak to you again! She might speak now, or later, or... I don't know! But speak she will! The Night Mother is part of you now! You get to hear voices inside your head! The rest of us should be so lucky." He will then bid you farewell with "Are you excited? Oh, you should be. Things are finally looking up!" "Cicero is dead! Cicero is born! The laughter has filled me, filled me so very completely. I am the laughter. I am the jester. The soul that has served as my constant companion for so long has breached the veil of the Void finally and forever. It is now in me. It is me. The world has seen the last of Cicero the man. Behold Cicero, Fool of Hearts - laughter incarnate!" "The fool went absolutely berserk!" When you return to the Sanctuary to receive your reward for Breaching Security, you will be greeted by an upset Gabriella: "It's... Cicero. There's been an incident. You should proceed into the Sanctuary. I'll let Astrid explain." In the main chamber, you will find the family gathered around a heavily wounded Veezara. A furious Astrid will tell you what happened: "The fool went absolutely berserk! He wounded Veezara, tried to kill me, and then he fled. I knew that lunatic couldn't be trusted." Festus Krex will then take over: "It's true, I'm afraid. Cicero was a little whirlwind, slashing this way and that. It would have been funny, if he weren't trying to murder us all." Nazir will follow up with "Don't forget the ranting and raving. About the Night Mother, how she was the true leader of the Dark Brotherhood, and Astrid was just a "pretender."" When Astrid approaches you, she will hand you a direct order: "I want you to find that miserable little fool and end his life!" As it turns out, her husband Arnbjorn followed Cicero into the wilds and disappeared. 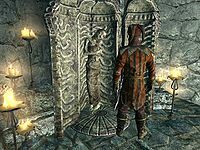 A quick investigation of Cicero's now abandoned quarters will reveal a number of journals describing Cicero's thoughts about Astrid and how he visited an abandoned sanctuary in Dawnstar. It also tells the tale that Cicero couldn't stand the silence of the Night Mother and decided to head for the other Sanctuary in an attempt to bend Astrid towards the Old Ways. When you return to Astrid, she will explain it herself: "Cicero's problem isn't his madness. It's an adherence to an ancient, outmoded way of life. The Night Mother's ways... simply are not our ways. He just couldn't accept that. And now he'll have to pay the price." She will also say " Well... If I'm being honest, I haven't exactly been discreet lately in expressing my frustration with this whole situation. Obeying the Night Mother. You being the Listener. It's ridiculous. No offense. Cicero may have overheard me talking to one of the others about the Night Mother. It's possible I was... not entirely respectful. But to go this far. To attempt to murder the leader of a Sanctuary. Cicero must pay with his life. There is no other option." Lastly, the other members of the family will gladly share their hatred towards Cicero. Babette: "Cicero destroyed any sympathy I may have had for him when he wounded Veezara. Kill the fool and be done with it." Veezara: "Yes, do not underestimate Cicero. A man like that, small and foolish, is easy to mock. To underestimate. Don't make the same mistake I did." Gabriella: "I feel only pity for Cicero. He must die, of course, but can any of us truly blame him for his actions? We mocked him, disrespected the Old Ways. Our actions were shameful. Surely, the Night Mother weeps this day." Festus: "All right, so maybe I was wrong. Maybe Cicero coming here wasn't the best thing that could have happened. But even I didn't anticipate this. Well, you know the old saying. When life gives you lemons... go murder a clown." "And now we come to the end of our play. The grand finale." "Listener! Is that you? Oh, I knew you'd come. Send the best to defeat the best. Astrid knew her stupid wolf couldn't slay sly Cicero." "Oh, but this isn't at all what Mother would want. You kill the Keeper or I kill the Listener? Now that's madness." "Ouch! Pointy pointy! My home is well defended. I always have been a stickler for details. Get it? 'Stick-ler.' Ha ha ha ha ha ha ha! Oh, I slay me!" "You're... still alive. Cicero respects the Listener's abilities, of course, but could you at least slow down a bit? I'm not what I used to be. Heh." "Brrr! Chilly! You'll enjoy this. Not an original part of the Sanctuary, per se. Let's call it a 'forced addition.' Forced by what? Oh, come and see!" "All right, so Cicero attacked that harlot, Astrid! But what's a fool to do, when his mother is slandered and mocked? Surely the Listener understands!" "Cicero admits, he thought the Listener would be dead by now. Heh. Maybe we could just forget all this? Hmm? Let bygones be bygones? What do you say?" "If it's any comfort, I do feel slightly bad about Veezara. Stupid lizard got in my way! But please tell me that hulking sheepdog has bled to death." "Behold the final trick of the Fool of Hearts!" "There is only one cure for your madness, Cicero. Me." "Oh, I like that! Very good, very good! Creative! But killing me would be a mistake! Oh yes. You would displease our mother, hmm? For she's your mother too, isn't she... Listener? Walk away! Let poor Cicero live! Tell the pretender Astrid you did the job! Stabbed, strangled, drowned poor Cicero! One little itty bitty lie!" "Traitor? Me? Silly assassin. So confused, so confused... and they say I'm mad! If I'm a traitor, so are you! Have you not heard the maiden's voice? Are you not the Listener? So walk away! Let poor Cicero live! Tell Astrid you did the job! Stabbed, strangled, drowned poor Cicero! A tiny white lie for a dark assassin!" "Oh, you prefer to listen, eh? Of course, of course! The Listener listens! A joke! A funny joke! I get it. Then listen to this - don't kill me. Let poor Cicero live! I attacked the strumpet Astrid, I did! And I'd do it again! Anything for our mother! Return to the pretender, tell her I'm dead! Tell her you strangled me with my own intestines! Ha ha! But lie! Yes, lie! Lie, and let me live!" He will then await his fate, and will repeat: "Do what you will. Cicero has no fight left. In the end, Sithis will judge us both." Cicero is of course lying. If you can't kill him in a single blow, he will jump up and attack, screaming: "Ha ha! Behold the final trick of the Fool of Hearts! You think me near death? Think again!" He will then maniacally attack you, laughing and shouting: "Ha ha ha ha! ", "For the Night Mother! ", "Who's the fool now?" or "Stab you, stab you, stab you!" If you hit him, he will respond: "Come on! Do it again! Ha ha ha ha ha! ", "I'm bleeding! Ha ha ha ha ha! ", "Ow! Cheap shot!" or "Is that the best the Listener can do?" If you finally manage to slay him, his final words will be: "Coming... Mother..."
"The Sanctuary is safety, and salvation. But silent, so silent. I give my love to the Unholy Matron. I give my laughter freely. But I do not hear her. The silence has returned. Now that I am laughter, and no longer hear laughter, I once again hear the silence. The silence of the Void. It reaches across time and space. Its silence is deafening, once more." "...must oil Mother soon... ...get all the hard to reach places..."
Much later, after the quest Hail Sithis!, the Dawnstar Sanctuary will be the new home for the family and Nazir will ask you to spend the sizable reward to refurnish the sanctuary. When you leave, provided you spared him during The Cure for Madness, Cicero will turn up outside, shouting "Listener!" Three options are available, although all will result in the same odd response: "Oh yes, it is Cicero! You were a fool to spare me. What, did you think I would be grateful? Cicero should be Listener! Not you! Now you will die!" After a moment of uncomfortable silence, he will reveal he was joking: "Ahhh.... gotcha! Oh, Listener, you should see the look on your face! Ha ha ha ha ha ha ha! Oh, Cicero has returned! Not to kill the kind Listener, but to serve, until one of us dies horribly, in service to our Mother! Best friends forever! In the meantime, I'll make myself at home in the Sanctuary. I'm sure Mother needs... tending." He will then enter the now-populated Dawnstar Sanctuary and be available as a follower if you should ask (see this section for his specific follower dialogue). Whenever you approach him, he will say "Cicero is at your service, oh great and powerful Listener!" or "Let's kill someone." When the surviving family members learn about Cicero's return, they will reluctantly accept him as part of the Brotherhood. Nazir will comment, "Why am I not surprised to learn Cicero is alive? I still can't stomach the little clown, but if you've welcomed him here, I won't question it", while Babette will be understandably confused: "So... wait. Cicero is alive? And we're all friends again? I swear, I can hardly keep up..."
"He he he he he he he he he he." "He he he... Crazy? Cicero? He he he he... That's madness..."
"Oh yes, mistress. You're the "boss." For now." "...ho ho ho, and hee hee hee, break that lute across my knee... and if the bard, should choose to fight, why then I'll set his clothes alight..."
"...and if I spy a singing bird, I'll snap its neck before it's heard..."
"...and I said to the baker, "You're not dead! You're a faker!" But if that's your wish, I'll oblige..."
"...oh if I chance to see a cat, I'll feed its corpse to my pet rat..."
"...and he says to the man, "That's not a horker! That's my wife!" Ha ha ha ha ha... Ah... I love that one..."
"...when I next meet, that fair maid Nelly, I'll plunge my knife into her belly..."
"...tra la la, tra la lee, da da dum dum, dee dee..."
"...madness is merry, and merriment's might, when the jester comes calling with his knife in the night..."
"...What? Mother? Is that your voice I hear? Hmm... No, no... Just my head playing tricks... Foolish Cicero..."
"...need to sharpen my blade... make it shiny, gleamy, and oh so deadly..."
"...dear Cicero will keep you from harm, sweet Mother. Forever and always..."
"...is there singing in the Void? Dancing...? Surely the Dread Lord will at least allow poor Cicero to caper..."
"...Cicero is hungry... ...need a sweetroll... or a carrot..."
"...need to get Mother some flowers... pretty, pretty flowers..."
Cicero is Near Death "Ow... It hurts when I laugh. He he..." "Stab you, stab you, stab you!" Witnesses an attack "Oooh. Time to kill?" "Ooh. That had to hurt." On Road and witnesses an attack "What? Why would the stranger attack innocent Cicero?" Dawnstar and witnesses an attack "Ow! What did I do?" "What have I done, Listener? Has Cicero offended you?" Witnesses a Murder "It's... it's like watching an artist create a masterpiece." "And another soul for Sithis." "You are an inspiration. Do you know that?" On Road and caught pickpocketing Cicero "What do you expect to find? My juggling balls? He he." Caught pickpocketing Cicero "Hey, that's my lint! Ha, Cicero is just joking. You can have it." "If I had anything worth giving, I'd have offered it already." Pickpocket someone else "Anything good in there?" "See if they have any cheese. I'm getting a bit... peckish." In Riften "Riften. Cicero likes Riften. Cheats and ruffians and cutthroats abound. Finally, some fun." 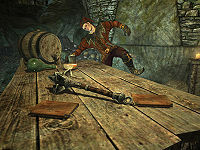 In Riften "...Cicero never understood thieves, really... take someone's things before you kill them? And they call me crazy..."
In Windhelm "Oohhh... Cicero's heard about the Butcher. Interesting knifework. Just... Stab, stab, stab, stab, stab! And then... Stab, stab, stab, stab, stab!" In Solitude "Hmph. "Solitude." Lonely Cicero could tell you a thing or two about solitude..."
In Solitude "...the High King's court needs a jester... But not me. No, not Cicero. The Fool of Hearts is busy enough, thank you very much..."
In Markarth "...I saw a dwarf! I did! I did! Cicero saw a dwarf! There... Oh. No, sorry. No dwarf..."
In Markarth "...Forsworn think they're so scary... Cicero will show you who's scary... Stupid Forsworn..."
In Whiterun "...Oooh... Cicero wants some Skyforge Steel! Sharp sharp, for easy stabbing..."
In Whiterun "Oh! Oh! 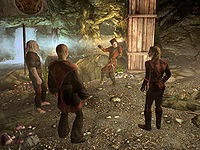 Maybe Cicero will go to Jorrvaskr and dance for the Companions! They'll... Um... On second thought... maybe not." Never mind. I don't need anything. "Oh, all right then, Listener. Cicero will just carry on with what he was doing. Until you say otherwise." I command you to accompany me. "Oh yes, Cicero and the Listener! On the hunt!" Follow me. "Off we go." Follow me. "Oh, but the Listener jests with poor Cicero. You already have company. You don't need my help at all." Wait here. "Yes, Listener! I will remain in this very spot until you tell me otherwise. Spiders could eat my face off and faithful Cicero would not move an inch!" I need to rearrange your equipment. "Ooh! Listener! That tickles!" I need you to do something. "Does it involve sneaking and stabbing? Ooh, please say yes!" You're dismissed. Return home. "Home again, home again! I'll return to the Night Mother straightaway!" You're dismissed. Stay in the Sanctuary. "Oh, of course. Mother needs me, after all." Command him to do a task. "With pleasure, my Listener." Sleep (owned). "Now wait a minute, Listener. Even Cicero has his limits! Not many, mind you...but I do have them!" Asking him to do an impossible task. "Oh Listener. Can't you see that's impossible?" Canceling a command. "Nothing else? I'm always eager." Attempting to talk to him when he is performing a commanded task. "You want me to do something or not?" Cicero is voiced by Andrew Morris. 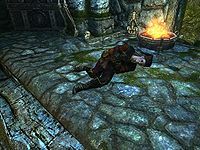 If you have acquired the Greater Power Summon Spectral Assassin and choose to summon the Ghost of Lucien Lachance during the Dawnstar Sanctuary quest, Lucien will provide commentary, telling you that killing Cicero is not something that Sithis desires. Cicero as met during the quest Delayed Burial: base ID 000550F0, ref ID 000550F1. This Cicero is level 6, unaggressive, has morality of "Property Crimes Only", and belongs to the CrimeFactionPale and FavorExcludedFaction factions. Cicero as met in the Falkreath Sanctuary: base ID 0001BDB1, ref ID 0001E64A. 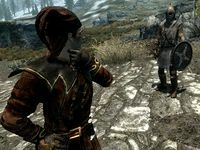 This Cicero is level 40, aggressive, has morality of "No Crime", and belongs to the DarkBrotherhoodFaction, Dawnstar Guardian Faction, and FavorExcludedFaction factions. 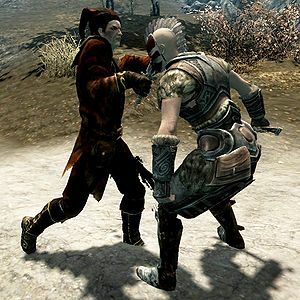 Contrary to what would be expected based on Cicero's storyline, Cicero favors sword-and-shield or archery over dual-wield when used as a follower. Cicero is essential as a follower. If you want to kill him, you must do so during the quest The Cure for Madness. When Cicero is humming, the subtitles say he is whistling instead. Cicero also appears in the Dark Brotherhood card set from the story expansion The Fall of the Dark Brotherhood for Legends as the card Cicero the Betrayer. In the Falkreath Sanctuary after his initial arrival, using a shout around Cicero may result in him referring to you as the Listener: "For someone called the 'Listener,' you do an awful lot of shouting..." This will happen well in advance of the relevant Dark Brotherhood quest. Cicero may not follow the "Wait here" command as a follower until he finishes his dialogue. He will continue to follow you around but will still have "Follow Me" as a dialogue option. If you have Cicero as your follower during AwakeningDG, he might act like your follower without following the "You're dismissed. Return home." or "Follow me" dialogue options. He may respond with normal dialogue but does not follow you or count toward your follower count. ? Reload a save before the Awakening quest. This page was last modified on 11 March 2019, at 22:11.